Celebration for ag at statehouse. Morgan Dawson, Indiana State FFA president, stood in for Mitch Daniels to read the proclamation he wrote to declare this Ag month in Indiana. Dawson read the proclamation during the month opening celebration today in the north foyer of the Indiana statehouse on the second floor. As someone in the crowed said, "she's prettier than Daniels anyway." Dawson, from Scottsburg, will lead the Indiana FFA state officer team until the 2011-2012 Indiana FFA state officers are elected in June of this year. Morgan Dawson, Indiana State FFA president, stood in for Mitch Daniels to read the proclamation he wrote to declare this Ag month in Indiana. The words were typical—with enough 'hereby's' and 'therefore's to make any politician proud. It was a fitting tribute, however, to the ag industry in Indiana. 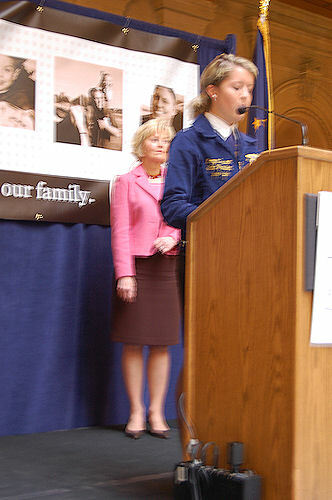 Both Daniels and Becky Skillman, who stood behind Dawson while Dawson was at the podium, have been overall supportive of agriculture during their one term plus in office. Indiana commodity groups and Indiana Farm Bureau arranged for the celebration, which included displays by various state and federal agencies, including the Board of Animal Health. Bret Marsh, state veterinarian, was on hand as well. Other FFA notables included Steve Hickey, the new Indiana FFA Association director, working under the Indiana State Department of Agriculture, Anna Ariens, his assistant director, and Lisa Chaudion, now the Indiana FFA Foundation Executive Director. She is also the official Indiana FFA advisor. Also on hand were several legislators, including Bill Friend, Macy, and other state leaders, including Indiana State Department of Ag director Joe Kelsay. Jared Chew represented the Division of Soil Conservation within ISDA. He is director of that division. Meanwhile, Mike McGovern, communications specialist with the natural Resources Conservation Service, manned a booth for NRCS. Part of the idea for the booths was to educate others who visit the statehouse about agriculture, spokesmen said.